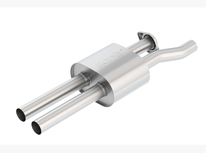 This muffler/ resonator is for use with Borla® mufflers 60637 or 60638 to add sound attenuation. 2017-2019 Ford Raptor 3.5L Automatic Trans. 2&4 Wheel Drive Crew Cab, Short Bed or Extended Cab Standard Bed.